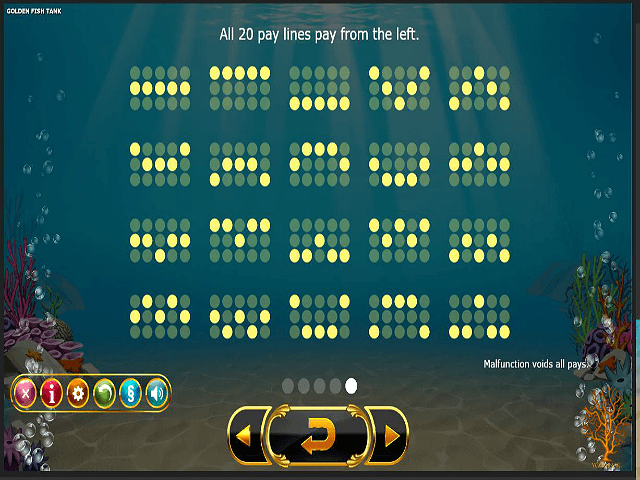 Take a trip under the ocean with this treasure-hunting, aquatic-themed online slot from Yggdrasil Gaming. If you're looking for a relaxing gaming experience, this is where you'll find it. The calming setting and colourful characters make each game a real pleasure, with plenty of long-lost sunken spoils to win. With five reels and 20 paylines, there are lots of options when it comes to casting your net for those payouts. You can also enjoy free spins in this game; the special Golden Bet mode can make those free spins count for even more. It's possible to win up to €10,000 in a single spin on this slot, so it's well worth diving into. 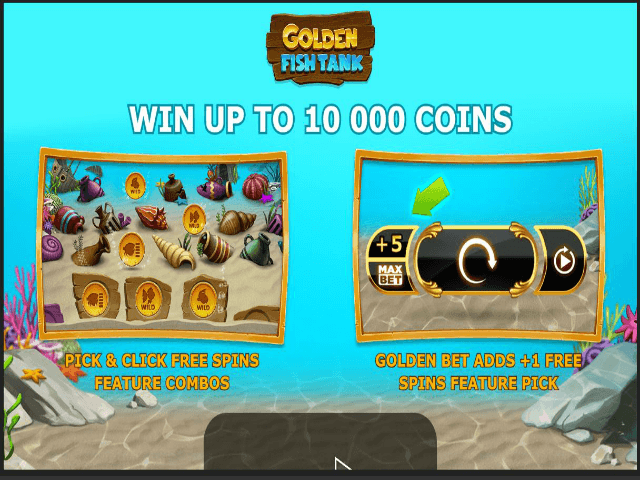 Play Golden Fish Tank Slot Demo for Free! 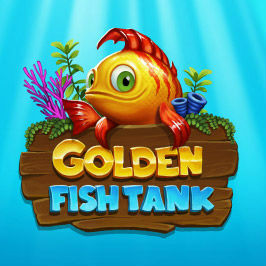 Play Golden Fish Tank for Real Money! 100% First Deposit Bonus up to €100 + 50 Extra Spins! €1000 Welcome Bonus + 50 Extra Spins! Golden Fish Tank's graphics are sharp and clear, with bright and colourful fish as the symbols. The fish icons are all animated too, gently bobbing along in the water. The atmospheric, tropical style music is the perfect backdrop to play to, while the rising bubbles on each side of the screen are a nice touch. There's a mix of playing cards alongside the fish when it comes to the symbols, with the 20 paylines set from left to right. That means there's good odds when it comes to matching the three symbols needed for a free spin. The Golden Bet spin is this game's extra-special feature. Symbols are split into two types: fish and royals. 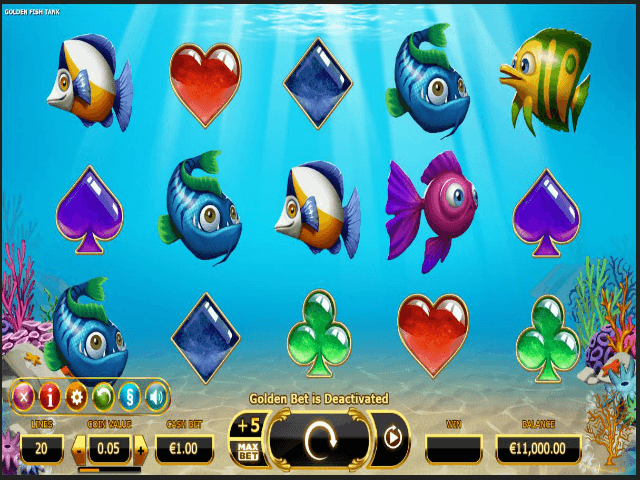 Golden Fish Tank is a standard slot in that when you line up a few matching symbols, you'll win prizes. The fish themselves offer the best payouts (which makes sense, given the game's setting), with the white and orange fish worth 200 coins if matched. Royal symbols are worth less, with hearts the most valuable at 75 coins. There's lots of potential for matches though, thanks to the fact that there are 20 paylines altogether. Coins can be worth up to two euros, so if your luck's in, you could win €10,000 or more. Total payout does depend on a few things though. Firstly, there's the Golden Bet feature. This adds five to whatever your bet size is. It's a small +5 icon above the maximum bet button in the bottom centre of the screen. Once you've clicked this, your bet value rises by five even if you’re at the maximum, before you enter the Golden Bet mode. The bottom buttons will all turn gold to let you know what mode you're playing in, but the main difference to the game is how it affects the bonus round. If you can get into the bonus mode with the Golden Bet activated as well, you'll get a free extra feature in the free spins game. This can lead to the largest payouts. The free spin games are activated by getting three, four or five of the free spin symbols matched up in the standard game. This activates the bonus game, where you can choose a few extra features by opening the seashells on the ocean floor. These will give you things like extra free spins, random wilds and more. It's also why the Golden Bet mode can help you win even bigger, as you get an extra feature to choose from. So, if you're a fan of ocean-dwelling creatures and want a relaxing slot experience, dip your toes into the Golden Fish Tank at one of our recommended casinos. The high-paying bonus and Golden Bet mode are also appealing if you like a little more depth to your game. Share this Golden Fish Tank Review today! 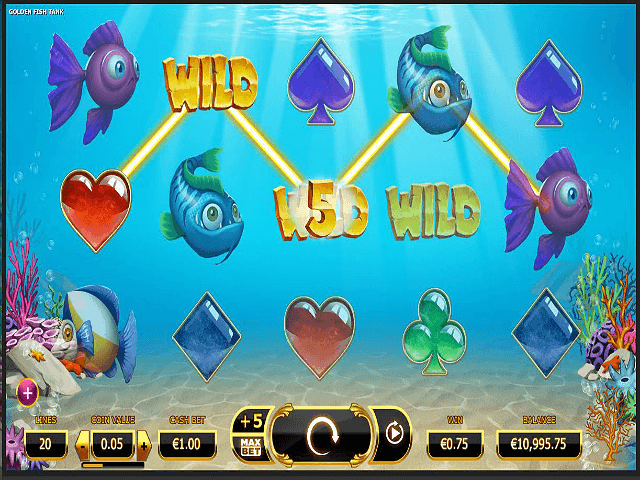 If you like Golden Fish Tank, you'll love these slot titles too!